Here are the highlights from Rachael Ray's talk show this week. For the recipes from this week's show, check out the shopping list and the recipe archive. The recipes are listed by category in the order they appear on the show. 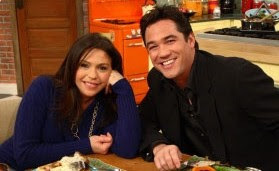 Monday: Dean Cain visits Rachael and they make an Italian barbeque recipe. We also get to learn an how to get kids to be well-behaved at the dinner table. And this sounds really cool - "Todd Oldham shares his budget-friendly floral tips for the holidays." Rachael also teaches how to clean up burnt pots so they look like new. Tuesday: On Tuesday, Rachael fills her audience with 50 of America's hottest bachelors. We also get to learn double-duty decorating ideas using kitchen items and Carson Daly stops by (well, it says surprise guest and then there's a picture of him, so I don't think I am jumping to conclusions). Wednesday: Gary Sinise from CSI:NY (aka Lt. Dan from Forrest Gump) visits and swaps pasta recipes with Rachael. We can learn how to liven up a party, how to do a clothing swap with friends (a fashion potluck) and how to do place settings. Also, another round of Stump the Rach. Thursday: We get to learn the "one thing that will make your holiday party stress-free -- it’s simple, affordable, and works for any size party!" That sounds intriguing. More fashion on this show, too - learn common fashion mistakes and solutions. And more tips! I need this one - how to wrap the perfect present. Friday: The week ends with a 90-day challenge for single women everywhere. Kristan shares "double-duty household tips using stuff you've got in the house, and find out why it's good to be green." Updates: Did you see the feature about santaspeaking.com on Rachael Ray's talk show? Learn more about it here. 50 hottest bachelors you say? I did say. And they look pretty hot.